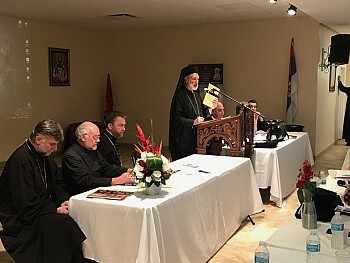 We, the clergy, monastics, and representatives of the people of God, ordained and elected members to the Annual Assembly of the Serbian Orthodox Diocese of Eastern America, Serbian Orthodox Church, have gathered together at the church of the Holy Great and Victorious Martyr George in the God-protected city of Clearwater, Florida on February 16 and 17, in the year of our Lord 2018. ‘Be holy because I, the Lord your God, am Holy’ (Lev. 19:2). Today, when we celebrate the memory of the Venerable Isidore of Pelusium, the Holy Spirit has gathered us in the community of the Body of Christ that He might bring us closer us to our Heavenly Father. Having announced the fullness of God’s Church, gathered around our Bishop, Father and Archpastor IRINEJ, we greet the fullness of the Serbian Orthodox Church in the person of His Holiness, the Archbishop of Pech, Metropolitan of Belgrade and Karlovci, and Serbian Patriarch IRINEJ. We give thanks to Almighty God for the gift of living in this country, where, in the true sense of the word, we may rejoice in our unity among Orthodox Christians of other jurisdictions. Preserving the inner unity of our own parishes and following the example of our Bishop, every day we have the opportunity to share in the lives of other Orthodox people and their traditions, such that in gathering we experience the fullness of the words of the Apostle that “There is neither Jew nor Greek, there is neither slave nor free, there is neither male nor female, for you are all one in Christ Jesus” (Gal. 3:28). That is why, here and now, we pray together that the Lord strengthens the faith of Orthodox Christians and guides us on the road to unity. We thank Almighty God also for His daily visitation to His people! This year, we have been abundantly blessed by the mercy that has flowed throughout all of Orthodoxy, particularly upon us, through the revelation of the incorrupt remains of St. Mardarije of Libertyville and All America. In the year in which we commemorate the one-hundredth anniversary of St. Mardarije’s arrival in North America, the Lord has once again shown us this Saint as a further witness of His word. In July of 2017, the magnificent celebration at the Monastery of St. Sava in Libertyville, which St. Mardarije both built with his own hands and built himself in it, marked the jubilee of St. Mardarije’s arrival as a missionary. This was yet another occasion of the announcement of the universality and unity, not only within the Serbian Church, but among the entire Orthodox Church. “God is wonderful in His saints” (Ps. 67:36). From this place, we greet His Royal Highness, Crown Prince Alexander, Heir to the Throne, and his wife, Princess Katherine. We have them in our daily prayers, asking that the Lord strengthen and uphold them in their labors for the benefit of our people in the Fatherland. Repeatedly, in the course of the preceding year, they and other members of the House of Karageorge, visited our Diocese and our Bishop. Their sense of responsibility toward their own people encourages them to organize our people in the Diaspora for the sake of helping our relatives and friends in the land of our forbearers. Additionally, His Royal Highness invests considerable effort to represent our culture and traditions to others, drawing them in and encouraging other peoples, engendering a desire to help those for whom help is essential. The Royal Family’s years of experience in this field of charity confirms God’s blessings on them. God grant them Many Years! We also greet His Grace Longin, Bishop of New Grachanica and Midwestern America, and His Grace Kirilo, Bishop of Diocletia. We greet His Grace Maxim, Bishop of Western America and the Orthodox Institute of Saints Sebastian and Mardarije. This year, for the first time, we have had the opportunity to reap the fruits of their labors in our Eastern American Diocese. 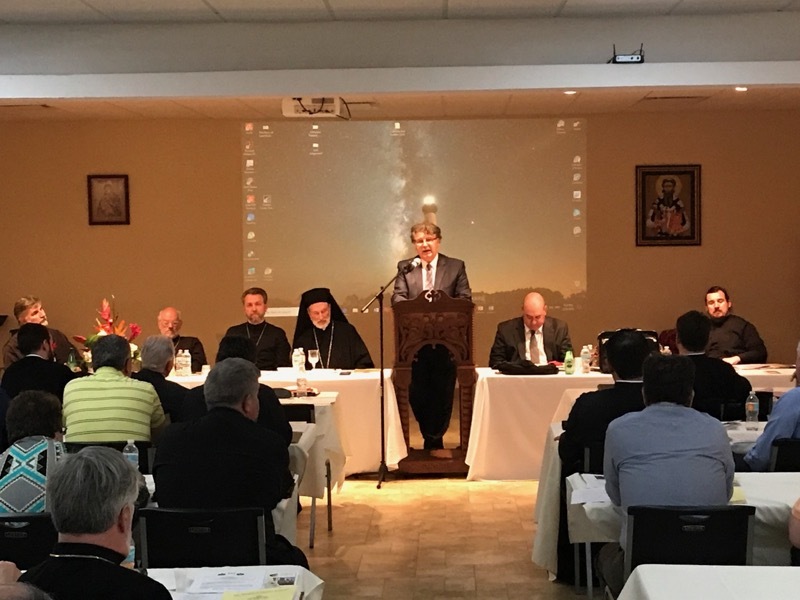 From February 13th to 15th, the clergy and faithful of North and South America had the occasion to discuss the challenges facing Christians today, in the spirit of Holy Tradition and ethos of the Orthodox Church. WHEREAS it is with a heavy heart that we express our condolences to the family, and, as such, to all the Serbian people, for the tragic loss of +Oliver Ivanovic. May his memory be eternal. THEREFORE, BE IT RESOLVED THAT with great hope in the Risen Lord, the fruits of his noble work may be of benefit to the Serbian nation, most notably in our province of Kosovo and Metohija. WHEREAS we must never forget the love of our Orthodox brethren in New York who during this difficult time came to our aid. THEREFORE, BE IT RESOLVED THAT we especially draw attention to the examples set by their Eminences, Archbishop Demetrios and Metropolitan Hilarion, the priests and faithful of the Greek Orthodox and Russian Orthodox Churches, who always opened wide their doors to our community, giving their churches and centers for our gatherings. May our Lord open wide the doors to the Kingdom of Heaven for them. 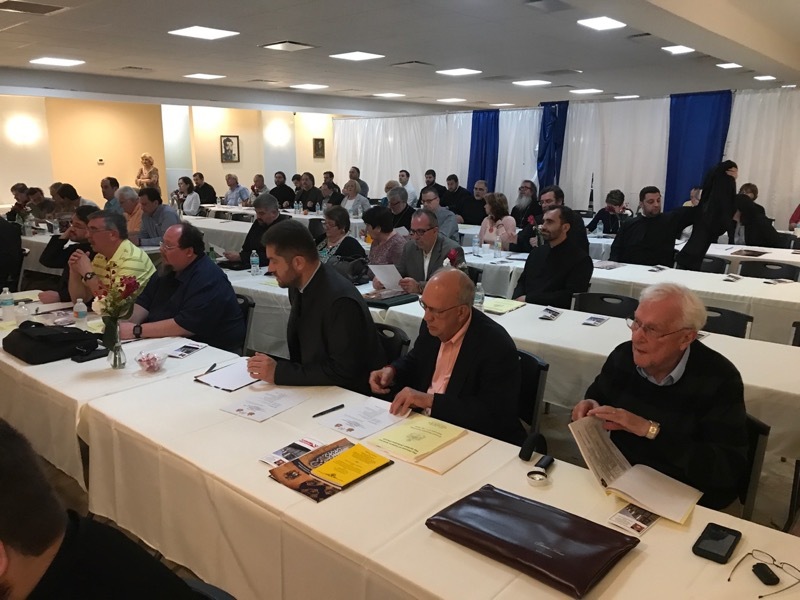 With gratefulness to God, during the previous year we were finally able to enact the decision of the Holy Assembly of Bishops, which stated that the Diocesan Center should be located in the largest city in the Diocese, in the City of New York. THEREFORE, BE IT RESOLVED THAT the new Episcopal Residence and Diocesan Center is now located at 65 Overlook Circle, New Rochelle, NY. THEREFORE, BE IT RESOLVED THAT we affirm the words of St. Ignatius the God-bearer: “Take heed to frequently gather at the Eucharist and in glory. For when you often gather in one place, then the strength of Satan is destroyed, and his devastation is brought about single-handedly by our faith” (To the Ephesians 13:1). WHEREAS Christ tells us, and history confirms, that the gates of hell will not prevail against the Church of God (Matthew 16:18). In witness of the same, during this past year we have celebrated one hundred years of existence of the Church of St. Stephen in Lackawanna, NY; fifty years of existence of the Church of St Stephen of Decani in Columbus, OH; fifty years of existence of the Church of St. George in Clearwater, FL; and twenty-five years of existence of the Cathedral Church of St. Sava in Boston, MA. THEREFORE, BE IT RESOLVED THAT the Diocesan Assembly of the Eastern American Diocese of the Serbian Orthodox Church congratulates all the above-mentioned parishes on their meaningful jubilees, wishing them many fruitful years in their life in Christ as they continue to witness to their faithful and to their surrounding communities the Truth of Holy Orthodoxy. The Church of God is a living organism, which breathes by the Holy Spirit and is expanding, is witnessed to us through the works of love of our people, seen in building construction. New churches are being constructed to the glory of God in Orlando, FL and Atlanta, GA. The end is in sight for the completion of the churches in Miami and North Port, FL. Additionally, in the course of the year, there was a groundbreaking for a chapel to be dedicated to the Holy Bishop Nicholai in Columbus, OH which will be the first in America to be built in the style of Njegosh’s chapel on Lovchen. The parish home in Clearwater, FL was also built and blessed this year, and in the following year, the frescoes in Charlotte, NC will be blessed. THEREFORE, BE IT RESOLVED THAT the Diocesan Assembly of the Eastern American Diocese of the Serbian Orthodox Church applauds the extraordinary efforts involved in creating new parishes and erecting new houses of worship, and prays for the continuing success of their efforts in the Vineyard of the Lord. Today, from this Assembly, we call all parents to educate their children in the knowledge of Christ. Our Lord Himself is the most important lesson in every educational endeavor, and we ask the parents to themselves be the example to their children in the life of Christ. We would bring attention to the fact that children at a certain age begin to question the faith and knowledge of the people around them, and they may oppose what they are hearing. At that time, it is most important that parents, through their example, continue to demonstrate what is essential in the child’s life. THEREFORE, BE IT RESOLVED THAT it is critical that parents not forsake their parental and spiritual responsibilities to their children, especially not at the moment when children show resistance even to the Church, but rather demonstrate the right path through their personal example. WHEREAS Vidovdan, the feast of extraordinary importance for the Serbian people, will in the future be celebrated at the Deanery level, for the benefit of our youth and all the Serbian faithful of each Deanery. THEREFORE, BE IT RESOLVED THAT we confirm the need for formation of a Youth Movement, under the Department of Christian Education in the Diocese of Eastern America, which is already in process. May God strengthen all those who labor in the Lord’s Vineyard, working toward the education of our youth. We also announce that, in addition to that which has been mentioned, it is important to highlight that our Eastern American Diocese will be the host on the occasion of the 100th Anniversary of the end of the World War I. The central commemoration on the North American continent will be held in Washington, DC on July 28, 2018. WHEREAS these three examples are the foundation of our Christian stewardship, principles by which the Church has lived in this world for two millennia. THEREFORE, BE IT RESOLVED THAT our faithful are called to uphold and donate to their Church communities the foundational gifts of time, talent and treasure, transforming their communities based on the Stewardship mandate given to us by our Creator. The Assembly gratefully acknowledges the local Church of God, the Diocese of Eastern America, with its predecessors, expresses its deepest gratitude to its worthy pastors in the Lord’s field who have, in the past year, retired from active parochial service: Protopresbyter-Stavrophor Dr. Rodney Torbic and Protopresbyter-Stavrophor Djordje Mileusnic. Those who are acquainted with these exemplary priests are familiar with their dedicated witness to the Risen Christ. In addition, this Assembly also expresses most sincere appreciation to Protopresbyter-Stavrophor Rade Merick for his diligent work and leading the Resolutions Committee for over 25 years. Many years, dear Fathers! The Assembly expresses it deepest gratitude to the Parish of St. George in Clearwater and to its priest, Protopresbyter-Stavrophor Dragan Lj. Zaric, dean of the St. Petersburg Deanery, for their hospitality and care on behalf of those who gathered both for the Institute and for the Assembly. It was a great joy to be in their midst, and we pray the Lord makes us worthy of such communion in His eternal community. Ми, свештенство, монаштво и представници народа Божјег, посвећени и изабрани чланови Годишње скупштине Епархије источноамеричке, Српске Православне Цркве, сабрасмо се у просторијама храма Светог Великомученика и Победоносца Георгија, у Богом чуваном граду Клирвотеру у савезној држави Флориди од 16. до 17. фебруара, Лета Господњег 2018. године. Данас када прослављамо Преподобног Исидора Пелусиота, Дух Свети нас Сабра у заједницу тела Христовог да би нас Он привео Оцу нашем небеском. Пројавивши пуноћу Цркве Божје, сабрани око једног Епископа, око оца и пастира нашега Г.Г. Иринеја, поздрављамо пуноћу Цркве Православне, Цркве Српске, у лику Његове Светости Архиепископа пећког, митрополита београдско-каровачког и Патријарха српског Г.Г. Иринеја. Благодаримо Богу Свемогућем на дару да живимо у овој земљи где у правом смислу речи можемо уживати радост међусобног и свеправославног јединства. Чувајући једниство унутар својих парохија а следујући примеру свога Епископа, свакодневно имамо прилику да заједничаримо са другим православним народима и традицијама те приликом тих сабрања долази до изражаја реч Апостола да „нема више Јудејца ни Јелина, нема више роба ни слободнога, нема више мушког ни женског, јер сте ви сви један човјек у Христу Исусу“ (Гал 3, 28). Зато се сада и овде сви заједно молимо да Господ учврсти веру православних хришћана и да нас води путем јединства. Благодаримо Свемогућем Богу и зато што свакодневно походи народ свој! Ове године смо посебно благодарни на изобилној милости коју је излио на православне широм света, а посебно на нас овде, откривајући нам нетрулежно тело Светог Мардарија Либертивилског и Свеамеричког. У години када прослављамо стогодишњицу његовог доласка у Сједнињене Америчке Државе, Господ нам га сада поново дарује да буде и даље сведок речи Његове. У јулу месецу 2017. године, величанственом прославом у Манастиру Светога Саве у Либертивилу, који и подиже Свети Мардарије уградивши себе у њега, обележен је јубилеј његовог доласка у мисију. То је била још једна прилика за пројаву саборности и јединства, не само Цркве српске, него целе пуноће Цркве православне. Диван је Бог у светима својим (Пс. 67, 36). Са овога места поздрављамо Његово Краљевско Височанство Престолонаследника Александра и његову супругу Принцезу Катарину. Свагда их имамо у својим молитвама да их Господ оснажи и подржи у њиховом труду на помоћи нашем народу у отаџбини. У више наврата током претходне године, они и други чланови породице Карађорђевић, посетили су нашу Епархију и Епископа. Одговорност за сопствени народ их подстиче да организују овај део нашег народа у расејању а ради помоћи својим сродницима и пријатељима у земљи наших праотаца. Осим тога, Њихова Краљевска Височанства улажу велики труд да на најбољи начин представе нашу културу и традицију да би привукли и подстакли и друге народе да помажу онима којима је помоћ потребна. Дугогодишње искуство на овом пољу потрвђује благослов Божји који је њима. На многе године! Такође поздрављамо Њихова Преосвештенства Епископе Г.Г. Лонгина, средњезападноамеричког и Г.Г. Крила, диоклијског. Поздрављамо и Његово Преосвештенство Епископа Г.Г. Максима, западноамеричког и Православни Институт Светих Севастијана и Мардарија. Ове године смо имали прилику да по први пут убиремо плодове њиховог рада и на источној обали, у нашој Епархији источноамеричкој. Од 13. до 15. фебруара, свештенство и верни народ Сверне и Јужне Америке, имали су прилику да разговарају о изазовима који се постављају пред хришћане данас а све у духу предања и етоса Цркве православне. Са великом бригом за опстанак нашег народа на својим вековним огњиштима, изражавамо поршку Његовом Преосвештенству Г.Г. Теодосију, Епискпу рашко-призренском и свима који помно прате дешавања везана за опстанак наше јужне покрајине, Косова и Метохије, и спасење њених житеља и светиња. Све више притиснути од моћника овога света, молимо се Господу да онима који ће сносити одговорност пред богом и народом, у историји и изван историје, подари мудрости у овим тешким временима за нашу земљу и народ у целини. Са великом тугом у срцу изражавамо најискреније саучешће породици трагично настрадалог Оливера Ивановића. Вечан му спомен. Са надом у Васкрслог Господа нека би његов рад био на добро целог српског народа а посебно на Косову и Метохији. Црква Божја није од овога света. Стога ће и страдати све до другог доласка Христовог. Иако живимо у земљи где нам не прети непосредна опасност рата, прогона и глади, наша Епархија и васколика Српска Црква је рањена пожаром који је уништио про-катедрални храм Св. Саве у Њујорку. Слава Богу, у овом кратком периоду од Васкрса, 2016, након стравичног пожара велики део посла је обављен у припреми за обнову. Трудом Епископа Иринеја, старешине Саборне цркве, протојереја-ставрофора др Живојина Јаковљевића, предводника послова, архитеке С. Дона Живковића, повереништва и целе Цркве Божје првог града света, Њујорка, згариште је рашчишћено и прпреме за наставак радова су у току. Свемогући Бог је и овде пројавио Своју милост и показао нам да увек јесте међу нама, и на исти начин јесте међу нама. Током рашчићавања светог олтара, свете мошти уграђене у часну трпезу пронађене су неоштећене. Благодаримо свима који својим молитвама, знањем и средствима помажу васкрсење наше катедрале. Никада не смемо заборавити љубав наше браће православних у граду Њујорку који нам у овим тешким временима притичу у помоћ. Посебно бисмо истакли пример Високопреосвећених Г.Г. архијереја, Архиепископа Димитрија и Митрополита Илариона, свештенства и верника Грчке и Руске Православне Цркве, који увек широм отварају врата нашој заједници уступајући им своје просторе сабрања. Нека би им Господ широм отворио врата Царства Небеског! Благодаримо Богу што смо током претходне године били у могућности да спорведемо у дело одлуку Светог Архијерејског Сабора да се Епархијски центар налази у највећем граду Епархије, у граду Њујорку. Нова Епископска резиденција и Епархијски центар се налази на адреси 65 Overlook Circle, New Rochelle, NY. Размотривши живот наших парохија благодаримо Богу за сва добра којим нас дарује. Овај наш Сабор, односно Скупштина, је такође сведочанство Божјег присуства међу нама: „јер гдје су два или три сабрана у име моје, ондје сам и ја међу њима“ (Мт. 18, 20). Стога и ми позивамо све верна чада Цркве да се редовно сабирају и сједињују са Христом – причешћују се Њиме! Следујмо речима Светог Игњатија Богоносца: „Старајте се да се чешће окупљате на Евхаристију и на славу. Јер када се често састајете на једном месту, онда се руше силе Сатанине, и уништава се његова погуба једнодушношћу наше вере“ (Ефесцима 13, 1). Христос нам каже, а историја попотврђује, да Цркву Божију ни врата пакла неће надвладати (Мт 16, 18). Тако смо у години која је за нама прославили сто година постојања Цркве Светог Стефана у Лакавани, Њујорк; 50 година Цркве Светог Стефана Дечанског у Колумбусу, Охајо; 50 година Цркве Светог Георгија у Клирвотеру, Флорида и 25 година Цркве Светог Саве у Бостону, Масачусец. Свим овим парохијама честитамо значајне јубилеје и желимо многе и благе године у животу у Христу! Да је Црква Божија живи организам који дише Духом Светим и развија се, сведочи нам и делатна љубав нашега народа у виду градитељства. Нови храм се диже у славу Божију у Орланду и Атланти. Приводе се крају радови на храмовима у Мајамију и Норт Порту у савезној држави Флориди. Такође, током године освећено је земљиште за капелу посвећену Светом Владици Николају у Колумбусу која ће, као прва у Америци, бити подигнута по угледу на Његошеву капелу са Ловћена. Подигнут је и освећен нови парохијски дом у Клирвотеру а у наредној гоидини биће освећене и фреске у Шарлоту, Северна Каролина. Са овога места позивамо све родитеље да своју децу васптавају у науци Христовој. У свакој науци је најважнији пример тако и њих молимо да сами буду приер својој деци у животу у Христу. Скренули бисмо пажњу на то да деца у одређеном узрасту почињу да преиспитују свет око себе и да му се супростављају. Том приликом је најважније да родитељ својим примером настави да показује шта је то што је важно у његовом животу. Онога момента када деца покажу бунт и према Цркви, важно је да родитељ не одустане него да истраје у свом личном примеру. Одсек за просвету и хришћанско образовање Епахије источноамеричке, под руководством ђакона Др Јована Аничића, наставља са својим важним активностима у погледу унапређења васпитања наше омладине. Као најплодоноснију актвност истакли бисмо одржавање летњих и зимских кампова у кампу Светог Саве у Шејдланду, Пенсилванија, као и манастиру Св. Марка у Шефилд Лејку, Охајо, који су већ годинама места сусрета и упознавања српске православне омладине широм Сједињених Америчких Држава и Канаде. Веома успешни зимски кампови одржани су у Орланду и Клирвотеру. Захваљујемо се свима који успешно организују овакве видове дружења а на првом месту Савезу Кола српских сестара Епархије источноамеричке. Истакли бисмо и одржавање првог породичног дана у манастиру Нова Марча, Охајо. Први број Дечјег Магазина, двојезичног (српско-енглеског) издања, објављен је пред сам празник Рођења Христовог. Видовдан, празник од изузетног значаја за српски народ, ће се у будуће прослављати на нивоу намесништава. Сабор потврђује потребу за формирањем омладинског покрета. Нека би Господ оснажио све прегаоце на Њиви Господњој који се труде да образују нашу омладину. Поред наведеног, важно је истаћи да ће наша Епархија источноамеричка бити домаћин приликом обележавања 100 година од завршетка Првог светског рата. Централна прослава на северноамеричком континенту ће бити одржана у граду Вашингтону 28. јула 2018. године. Страјући се једни за друге, старамо се за Цркву. Ослушкујмо потребе заједнице. Некад можемо помоћи својим стручним саветом, некада својим временом издвојеним за своју заједницу а некада и финансијским средствима која су потребна за живот у овом свету. Ова три примера су основ нашег хришћанског стратељства, принципа по коме Црква ево већ два миленијума живи у овом свету. Помесна Црква Божја, Епархије источноамеричке, са својим предстојатељем изражава најдубљу захвалност вредним пастирима на њиви Господњој који су се током прошле године повукли са актвног пархијског служења: протојереју-ставрофору Роднију Торбићу и протојереју-ставрофору Ђорђу Милеуснићу. Онима који познају ове дивне свештенослужитеље не треба много говорити о њиховом сведочењу Васкрслог Христа. На многе године, драги оци! Сабор Епархије источноамеричке најдубље захваљује Цркви Светог Георгија у Клирвотеру и њиховом свештенику протојереју-ставрофору Драгану Љ. Зарићу, архијерејском намеснику сентпитерсбуршком, на гостопримству и старању за све овде сабране, како учеснике Института тако и Сабора. Радост је била велика заједничараити са њима те се молимо да их Господ удостоји заједничарења у Његовој вечној заједници.